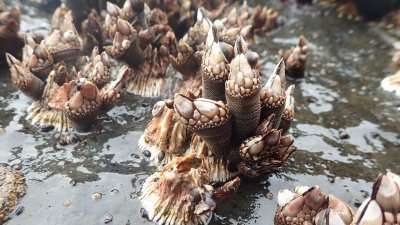 A study led by a University of Oregon marine biologist has moved the seafood industry one step closer to farming gooseneck barnacles, a pricey delicacy in Spain and a common sight on the West Coast. Led by Alan Shanks, a professor with the UO's Charleston-based Oregon Institute of Marine Biology, the researchers glued juveniles to textured, acrylic plates hung vertically inside 12 plastic tubes about twice the height and diameter of a can of tennis balls. Unfiltered seawater was pumped in, vigorously aerated and allowed to overflow. After a week, the barnacles began secreting their own cement. 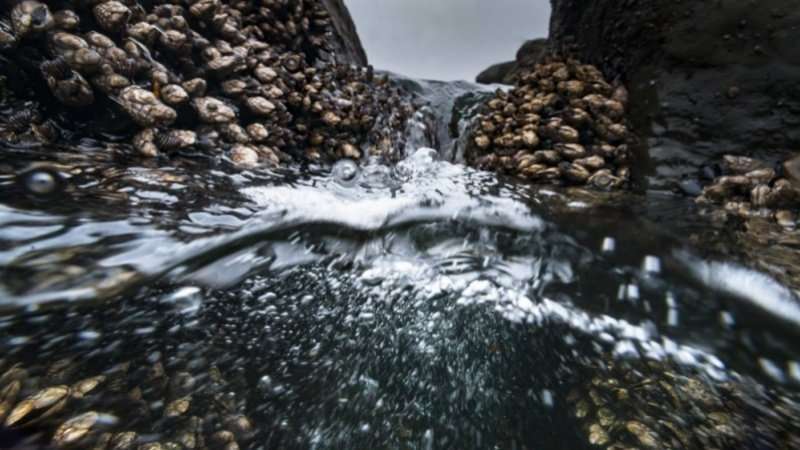 Twice a day for eight weeks, the researchers fed the barnacles either microalgal paste or brine shrimp eggs; a third group of barnacles was not fed anything but was left to filter food out of the seawater. Once a week the researchers measured the barnacles' growth. Those that were fed the brine shrimp eggs outgrew the other barnacles. "The experiment has demonstrated that feeding is not dependent on high water velocities, and barnacles can be stimulated to feed using aeration and will survive and grow readily in mariculture," Shanks said. Mariculture is a specialized form of aquaculture, the cultivation of marine life for food. He added that unlike high-flow systems, his low-flow "barnacle nursery" doesn't use as much energy or have expensive pumps to maintain, so it has the potential to decrease operating costs. Nevertheless, the researchers are cautiously optimistic. "While our experiment showed promise, there is still a great deal of research which needs to be done to solve some of the barriers to successful and profitable mariculture," said research assistant Mike Thomas. "For example, inducing settlement of gooseneck barnacle larvae onto artificial surfaces has historically proven difficult and this makes the implantation of barnacles a laborious task. There are other methods of mariculture which need to be explored further for their efficacy before deciding on the best method." Another part of Shanks' project involved conducting field research to see if there are enough gooseneck barnacles in southern Oregon to sustain commercial harvesting. The Oregon Department of Fish and Wildlife allows commercial harvesting of gooseneck barnacles on jetties but not on natural rock formations. Shanks hopes the agency will be able use the results of his work when regulating their harvesting. "Our surveys suggest that wild populations are unlikely to sustain long-term commercial harvest should the market significantly expand beyond its current size," researcher Julia Bingham wrote in a report about the project. She added that with the exception of jetties in Coos Bay and Winchester Bay, the other six jetties had such limited numbers of barnacles that even a "very small-scale harvest"—about 500 pounds per year per jetty—could wipe out harvestable-sized goosenecks on them in five years. Studying how long it takes for a population to return to pre-harvest densities. Testing different glues and surfaces to see if harvested barnacles that are too small for market can be reattached to plates and returned to the ocean. Testing out bigger tubes for rearing barnacles in the lab to make them feasible for larger-scale aquaculture. Testing other diets, including finely minced fish waste from a seafood processing plant.